Crystal Palace boss Roy Hodgson has played down speculation linking the club with a move for Jermain Defoe, Victor Moses and Yaya Toure in the January transfer window. 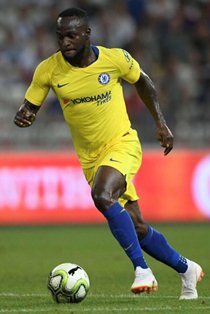 The former Nigeria international is reportedly a transfer target for The Eagles with Chelsea demanding a transfer fee of 12 million pounds but Hodgson has suggested that they are not interested in signing the winger. ''I don't hear them, because no one at the club mentions them to me," Hodgson told the broadcast media at Friday's press conference ahead of the home game vs Leicester City. Pressed for further details, the ex-England manager reiterated that Moses, Defoe and Toure are not among the players on their wish list next month at this moment. He added : ''If the day ever comes when the people within the club put names like that in front of them, I'll discuss them. ''But you are asking me if it is a fact we are discussing them, and I am saying as a fact, we're not discussing these names''. Moses had a nine-year spell at Palace before they were forced to sell him to Wigan Athletic in January 2010 after the club went into administration.